Close to 45.6 million viewers watched Trump’s 2018 State of the Union address, down from 47.7 million in 2017. Clinton saw a decline in viewership of 21 million people between his first two addresses, while Obama saw a roughly 4 million-person drop. The State of the Union disrupts network programming every year — even bumping a new episode of NBC’s hit “This is Us” to the following week for tonight’s address. But while the annual speech often sees declining viewership over the course of an administration, experts believe Donald Trump could see steadier numbers compared to his predecessors — due in part to the increasing spectacle of the modern political arena. Christina Bellantoni, a professor at the University of Southern California Annenberg School for Communication and Journalism, noted that over the years that she covered politics, the State of the Union itself has become more of an event. When she first started covering politics in 2003, Bellantoni said, it was “hard to get people who were into” the annual presidential addresses to Congress, which are steeped in pomp and circumstance. But it seems that’s no longer the case, she said, with more viewers likely to take it in and venture to Twitter to pick apart the minute details of the event — including where members of Congress sit, how they respond to remarks made during the speech and which celebrities or known figures make the guest list. And networks, particularly on cable, do their part to add to the spectacle. In the past, cable networks have devoted several hours of programming to the State of the Union or the congressional address, which typically comes months into a president’s first term, having flagship shows highlight exclusive interviews or behind-the-scenes access leading up to the speech. In recent years, digital coverage has come to the forefront, with networks offering viewers the ability to stream the address online and media outlets offering recaps of topical tweets. Gene Del Vecchio, an adjunct professor of marketing at USC’s Marshall School of Business, says the State of the Union — and politics in general — have become more like entertainment in recent years, taking on key elements of storytelling that might be found in a film or television show. Del Vecchio described Trump as a “master entertainer,” suggesting that could continue to prevent the type of year-over-year dropoff that have plagued other presidents of the modern era. 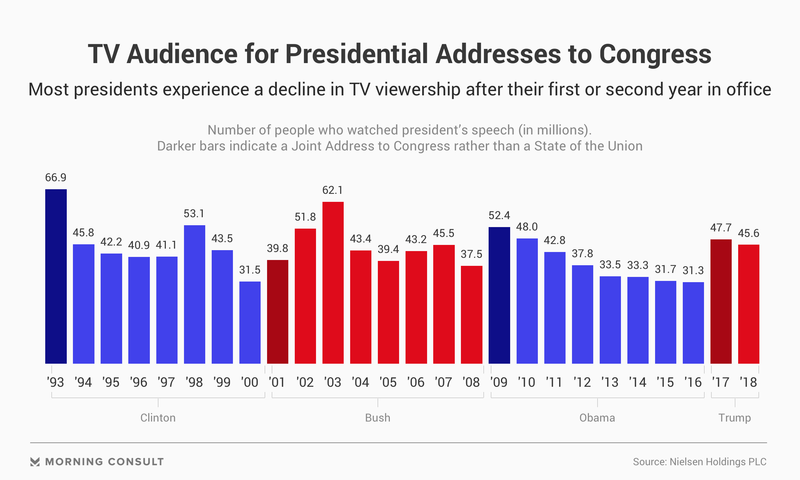 Nielsen data has shown that in most cases, viewership tends to decrease after the president’s first address, but in Trump’s case, the effect has been muted. For example, in 1993, President Bill Clinton’s joint address to Congress brought in 66.9 million viewers, while his 1994 speech was watched by 45.8 million people — a decline of more than 21 million. His final State of the Union as president was watched by roughly 31.5 million people. In 2009, President Barack Obama’s first address was viewed by roughly 52.4 million people, followed by about 48 million the next year. By 2016, viewership of his final address was down to 31.3 million people. By comparison, Trump’s 2018 State of the Union brought in close to 45.6 million viewers across the country, compared with 47.7 million viewers in his 2017 address, according to Nielsen data. “Given his nature, his leadership style, he will probably have one of the most consistent audiences for State of the Union addresses,” said Del Vecchio. Robert Thompson, director of Bleier Center for Television & Popular Culture at Syracuse University echoed Del Vecchio’s projection, but cautioned against attributing the viewership to entertainment value, and instead suggested that people will watch to keep up with the political events of the past year. To his point, President George W. Bush’s presidency provided a notable exception, seeing substantial increases between his first, second and third addresses amid major events of his first term, including 9/11. Karlyn Bowman, a senior fellow with American Enterprise Institute, was ambivalent about Trump’s ability to maintain steady audience numbers.